Faith Formation Hour: Sundays, 11:15 a.m. - 12:15 p.m. Faith Formation is the lifetime process of growing into our fullness as spiritual and ethical human beings. Faith Formation occurs as we face into life’s Big Questions...”What happens when we die? What is my purpose in life? How should I live? Who is my neighbor? How do I know what to believe?” As Unitarian Universalists, we do not provide answers; we give tools for seeking our own answers, and we provide companions for the journey. ORUUC intentionally nurtures faith formation in age-appropriate ways, through small groups that learn, serve, and care together. We also provide guidance and support for parents, their children’s primary agents of faith formation. All groups, Kindergarten and older, meet during Faith Formation hour. The Nursery and Preschool are open during both worship & faith formation hour. Faith Formation for Children and Youth is a cooperative venture. Please complete a Registration/Volunteer Form no later than your third visit. For more information on Faith Formation Volunteer opportunites click here. For specific instructions for Faith Formation Greeters and Hosts, click here. All adult leaders have been active at ORUUC for at least a year and have been recommended by the Youth Faith Formation Team. They have applied for their positions and provided references which have been checked by the Minister of Faith Formation. All leaders must adhere to church Safety Policies. Susan Rosenbaum, Childcare and Nursery Coordinator, and long-time church member, capably and lovingly cares for our tiniest ones, with the help of a weekly nursery assistant. We honor each family’s readiness to separate. Parents are welcome to remain in the nursery with their children. When leaving children, please take time to help them feel secure. Bring special items that may ease the separation. Also, bring diapers, extra clothing, and bottles as needed (label, please.) Let the caregivers know where you will be in the church building and when you will return. Please sign your children in each Sunday. Be sure a leader knows when you are leaving with your child. Whitney Cole, Preschool Coordinator, & her team of assistants, introduce children to a more intentional UU journey. Group goals are to be safe, have fun, make friends and learn. Everyone is guided to honor the group covenant, which was developed with group participation: Respect each other & things. Pick up. Ask to play. Choose what to do. Art and music are the focus for fifth Sundays. 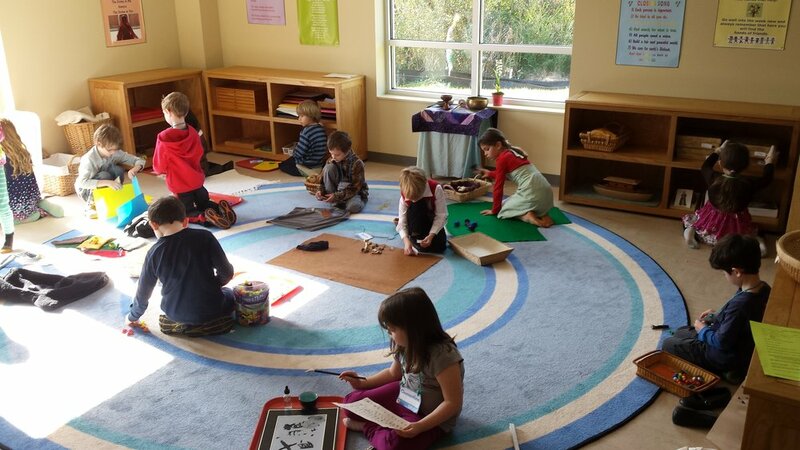 Spirit Play develops each child’s innate spirituality within the nurturing and broad-minded community that is the Unitarian Universalist faith. Children learn narratives of the history, religion, and shared human experiences that shape our world. A trained Storyteller tells these stories, using props. The weekly Story is followed by Wondering—open-ended questions about the story’s meaning & how it pertains to the children’s lives. During Work, children may choose to play with the story props or choose from a variety of art and other open-ended materials to derive their own meaning from the stories. The hour concludes with Feast and Blessing, a time to share a small snack, each other’s company, and best wishes for the week ahead. In this introductory group, children learn and explore the meaning of the 7 Unitarian Universalist principles. Children also explore the concepts of individual faith, spiritual practice and other faith groups. Differences include the feel of the room, the types of work materials available, and the lens of the church’s monthly themes and Unitarian Universalism’s six sources for the stories. Group members explore world religions, in light of Unitarian Universalism. The goal is deepening youth's understanding of the dynamic, fascinating, varied and endless world in which they live and applying that deeper understanding in positive ways. The group also gathers each month for fun. Each family takes a turn hosting a monthly event, with support from the Youth Coordinator. The opportunity to take 2 tripsto “The Mountain” helps youth connect withfellow UU youth from around thesoutheast. Attending worship is central to faith formation at this age. Youth may sign up for active roles in worship services. Speak with Jen Stark for more information. The group practices Compassionate Communication. Youth gather to support one another in their personal lives, as they grow & deepen their understanding of themselves & others. They choose their own curriculum. Ask U-ey is a youth advice column focused on issues of UUism, Self, Tough Stuff, Family, Relationships, In/dependence, School, Spirituality, Social Justice, & Tomorrow. Through reflection, youth are empowered to make choices in their lives that are aligned with their values and their understanding of who they are and intend to be. With guidance from the Youth Coordinator, the group also gets together for fundraising, fun, and social justice. They make weekend trips to “The Mountain” to gather with UU youth from around the southeast. The year culminates in a youth trip during the summer.